Well it is that time of year where there are a lot of options. I just spent a good 2 beers worth of time looking at past journal entries, emails, and pictures on my phone and comparing them to our trips this past week. 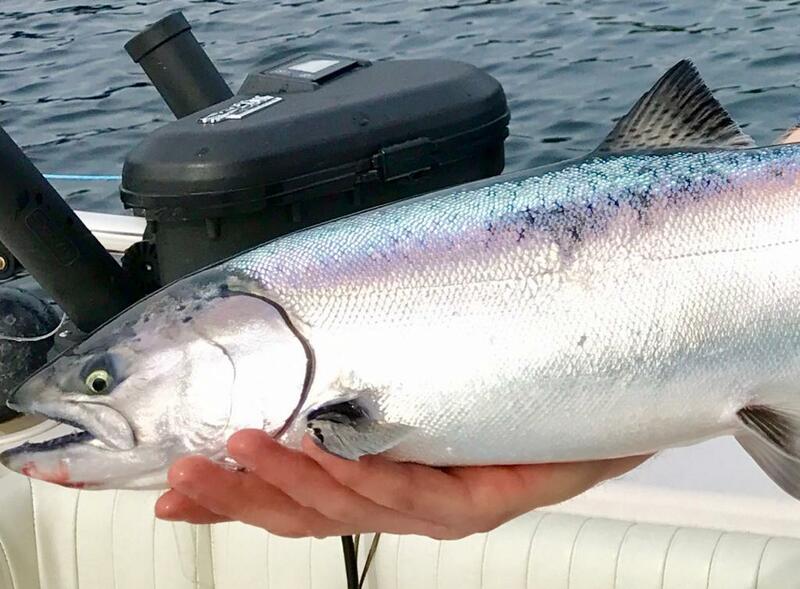 There really is no “one spot” this time of year and you can literally hit fish at all the spots in Vancouver Harbor or Howe Sound, off South Bowen from Roger Curtis to Cowan, off the Hump or QA, or at Thrasher. That’s a lot of water to cover and it is all about being in the right place at the right time. The fish are really moving around a lot and the algae bloom has also started. This bloom seems to push the fish around a bit and the bait and the fish definitely come up off the bottom now, but not all of them, so depth consideration is now a variable (you aren’t necessarily fishing both rods close to the bottom). Confused? Well you should be as there is no secret formula for late March and early April, you just have to pick a spot and put your time in. Jason about to release a winter chinook with the classic purple hues of a feeder. Here are a few tips for some of the areas that will be producing in the coming weeks in case you are a bit rusty on your offshore tacks. If you are going to venture out to the Hump, QA, or off South Bowen, try the 90-120 zone on your riggers. This is a good place to start and you can adjust lower or higher depending on what the fish are telling you and what you see on your sonar. Bright days they can be deeper and in dirty water and dark days they can be up as high as 45-60, especially first light. If you are fishing in the Harbour in 100-160 feet in the freighters or off the Bell, you should be getting good signals on your sonar (bait balls and fish arcs) and adjust accordingly. There have been fish caught right on the bottom this week as well as suspended. The same can be said for Howe Sound spots where we started seeing and catching suspended fish last weekend. Brett hooked up in Howe Sound! In terms of gear, the brighter colours are the way to go as the visibility has dropped. Try the following flashers; Salty Dawg, Chartreuse Phantom, BC, Green Onion Glow, STS, and Lemon Lime. Hootchies, bait and spoons are all working, but keep them bright. Think green, chartreuse, and glow. Some good colours are Irish Cream, Kitchen Sink, Homeland, Outfitter, and Trailhead when it comes to spoons. For bait teaser heads, try a Rhys Davis in glow with some green and chartreuse and you are good to go. For hootchies green and chartreuse glow splatter backs are where it’s. You gotta love the colours on this guy! Crabbing has been decent and so has prawning, so add that to your to do list as well.